Our Wednesday night group at church is studying James for the next 10 weeks, and I will be alternating chapters with my co-teacher. He is teaching chapter 1 over the next 2 weeks, and then I will teach chapter 2. To get ready to be a good participant in our small group discussion tonight I listened to the book of James several times today from my AudioBible mp3s on my phone. I listened to it while I ran, drove, cooked, etc. As we progress through the book over the next couple months, I will try to write some more in depth posts based on our small group discussions of James, but today I just wanted to write a few quick thoughts I had from things that really stood out to me while listening to the book. Do not just pray, but do. Do not just talk, but do. Do not just think, but do. James talks a good bit about prayer, and the call he gives in Chapter 5 to present our requests before God is pretty inspiring. In fact, James 5:15 has been one of the most important verses in my life ever since God healed me of Crohn’s Disease my freshman year of college. That’s a much longer story for another time, but the prayers of others brought about God’s healing. It was life-altering in so many ways, and I truly learned the power of prayer through that experience. James puts heavy emphasis on prayer, but when it comes to the way we treat one another, he makes it clear that praying for others is not enough. We also need to do for others. If we know someone who is poor or has financial or physical needs, and we have the ability to help meet those needs, then we should do more than just pray for God to meet their needs. We should get off our butts or get out our wallets and help however we can. Also, if a fellow Christian is living in sin or has turned from their faith, we should not only pray for them, but we should also go and challenge them and walk with them to try to help them repent and come back to God. James writes quite a bit about the way we talk. He warns that our speech can lead how we act, how we sin. He also warns that our tongues are evil and two-sided, mentioning that we can pray to God one minute and speak hateful words against fellow men the next minute with the same tongue. James challenges us to control our tongues and to speak kindly to people, using our tongues to lift each other up instead of tear each other down. James also says that it is not enough to speak encouraging words to people, but we should also do for people. In other words, it is not enough to speak kindly and encouragingly to those who are cold and hungry, but rather we should also give them clothes and food. 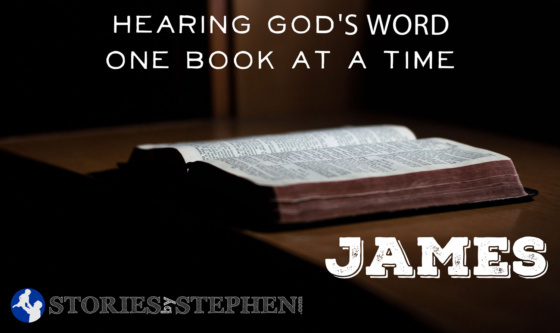 It simply is not enough just to hear God’s word, ponder God’s word or think about how great God’s word is. Going to church, small groups, accountability groups, prayer meetings or whatever other things you do to help you in your spiritual life is not enough if all we do is lots of thinking and talking. The point of all of this is to actively live out our faith and do whatever it is that God calls us to do. James is rich with quality content, so there is a great deal more to say in future posts on James.